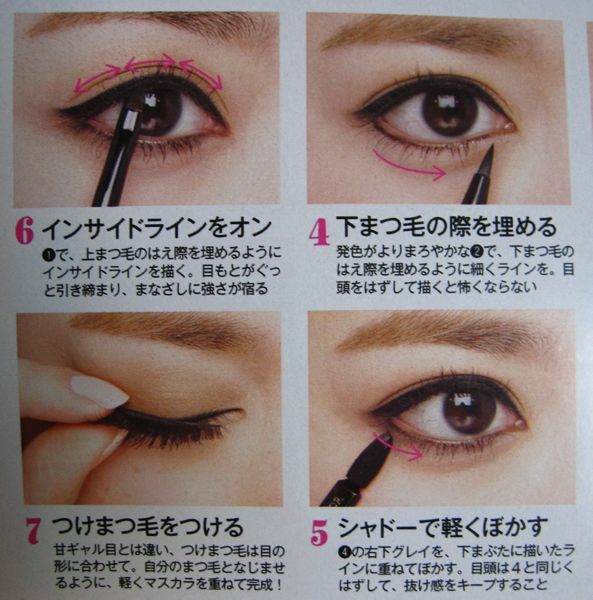 Here's the second tutorial on applying false eyelashes from the July issue of More. 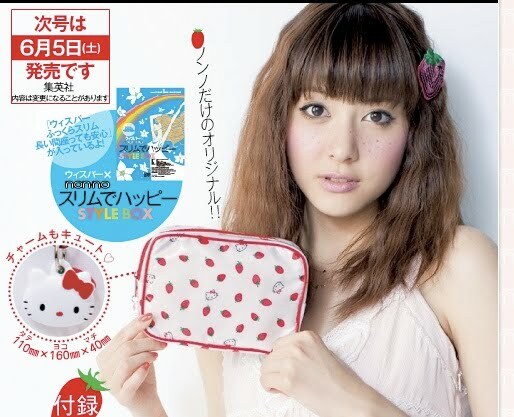 This is for a cool and chic look, quite different from the cute doll-like look for the other tutorial featuring Masukawa Tsubasa. The key points to master here are the long upward flick at the outer corner of the eyeliner on the upper lid and filling in the gaps between the lash roots with eyeliner to emphasise the length of the lashes. 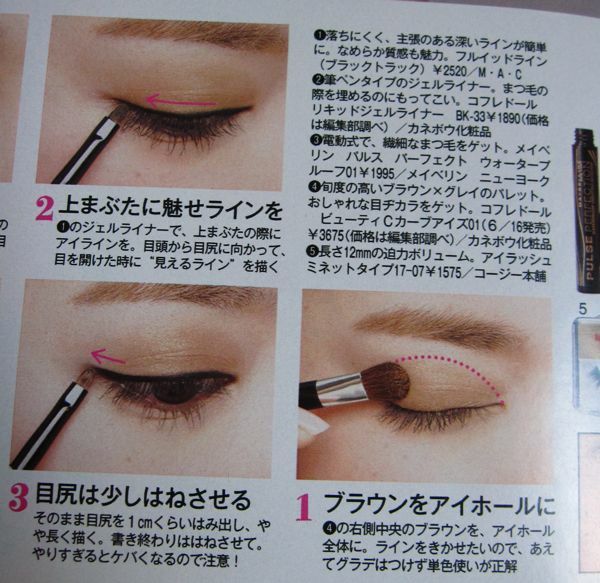 Step 1: Apply a brown eyeshadow over the eye socket area (from Coffret D'Or Beauty C Curve Eyes 01). Step 2: Using MAC Blacktrack Fluidline, line the upper lashline from the inner corner to the outer corner. Draw the line such that it is visible when you open your eye. Step 3: Extend the gel liner to about 1cm beyond the outer corner of the eye, in an upward flick. 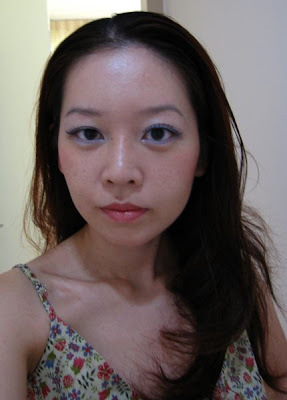 Step 4: Using Coffret D'Or Liquid Gel Liner BK33, draw a thin line along the lower lashline. 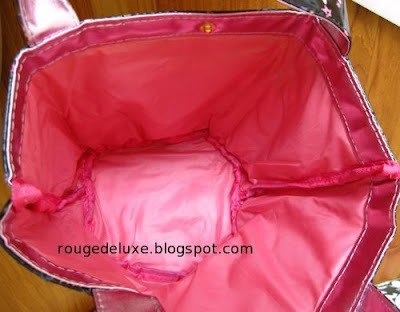 Leave a small gap from the inner corner to avoid looking too harsh. Step 5: Apply the greyish brown eyeshadow from Coffret D'Or Beauty C Curve Eyes 01 along the lower lashline. Step 6: Line the waterline of the upper eyelid with MAC Blacktrack Fluidline. 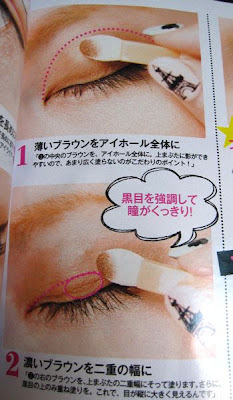 Step 7: Attach the false eyelash (Koji Eyelash Minette Type) and apply mascara. For Dolly Wink fans, you may be interested to know that the Dolly Wink range will be exclusively available again at the Watsons in Ngee Ann City from 10 - 16 June. 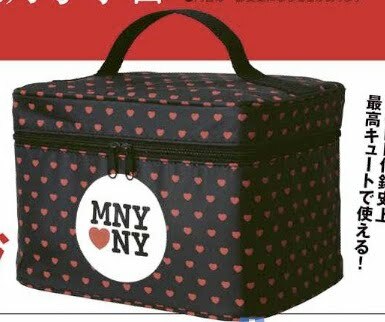 I heard from Mandom, which is the distributor for Dolly Wink in Singapore, that due to the low stock situation in Japan, there are very limited stocks available for other countries, which is why the range has not been made permanently available at the Watsons here. 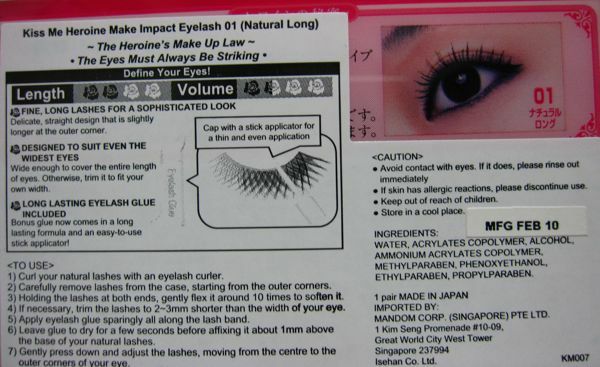 When the Dolly Wink range first went on sale for one week in January at the Watsons in Ngee Ann City, the most popular lash designs #1 and #2 sold out completely in one week, although the display remained for a couple more months. 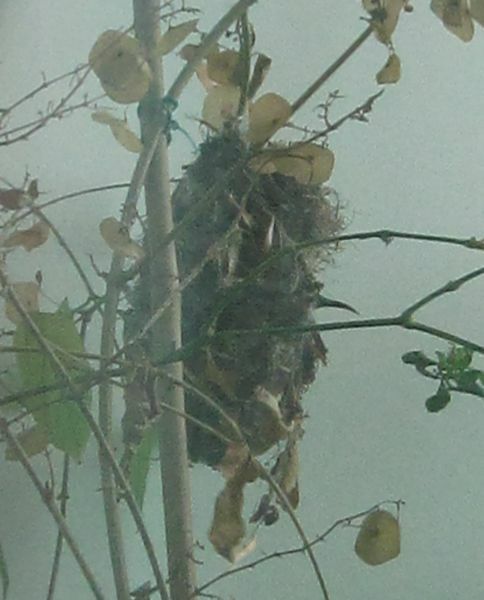 The display has since been removed but do look out for it again next week! 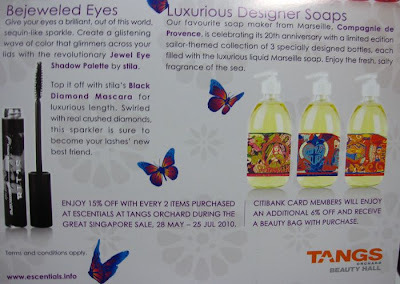 Just received a mailer from Escentials announcing that there will be a 15% discount with every two items purchased at their boutique in Tangs Orchard during the Great Singapore Sale from 28 May to 25 July. Citibank cardmembers get an additional 6% off and a beauty bag. 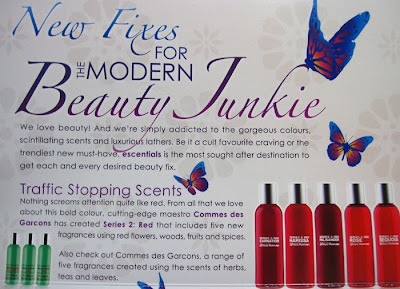 The beauty brands available at Escentials include Stila, Perricone MD, Ren, Annick Goutal, Diptique and By Terry. More magazine has a tutorial on applying false eyelashes by Masuwaka Tsubasa who is famous in Japan as a model for Popteen magazin. 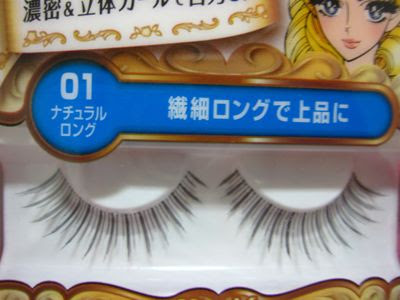 Tsubasa also has her own Dolly Wink line of false eyelashes and other eye makeup products, which can be found at the "Kawaii Corner" in Watsons in Singapore. Tsubasa prefers a doll-like look so she draws the eyeliner such that the outer corner extends downward. 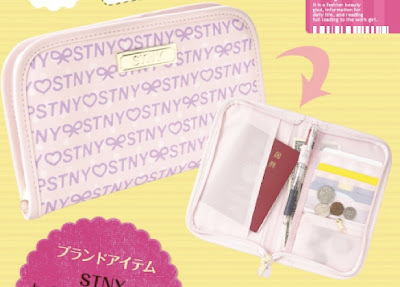 The Dolly Wink line and Tsubasa's makeup pouch (I spy the Paul & Joe x Alice in Wonderland blotting sheet case in there!). Tsubasa's staple eyeshadow palette is Bourjois Effet Lumiere #41. Step 1: Apply the light brown shade ( middle of the palette) all over the eye socket are, taking care not to blend it over too wide an area. Step 2: Apply the dark brown shade (extreme right side of the palette) from the upper lashline to the crease. Step 3: Apply the highlight shade (extreme left of palette) along the lower lashline. 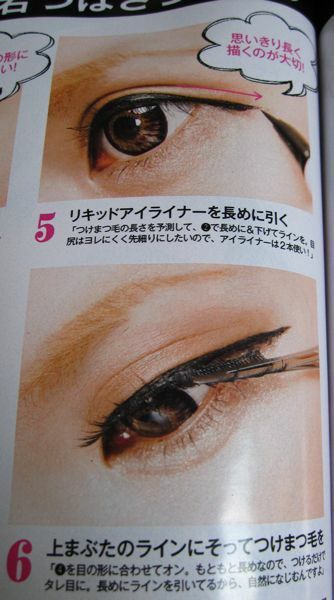 Step 4: Use the black pencil liner to line the upper lashline, filling in the spaces in between the lashes. Step 5: Use the Dolly Wink Liquid Eyeliner in Deep Black to line the upper lashline and extend the outer corner to slightly past where the false eyelash is expected to end. 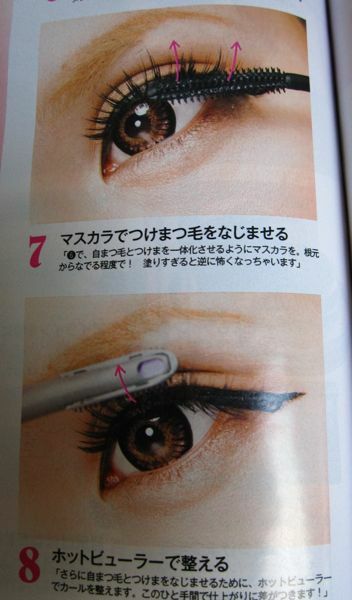 Using the liquid liner over the pencil liner helps to make the liner last longer and look more intense. Step 6: Attach on the Dolly Wink eye lash No. 1. Step 7: Apply mascara but be careful not to over-do it so as not to look scary! 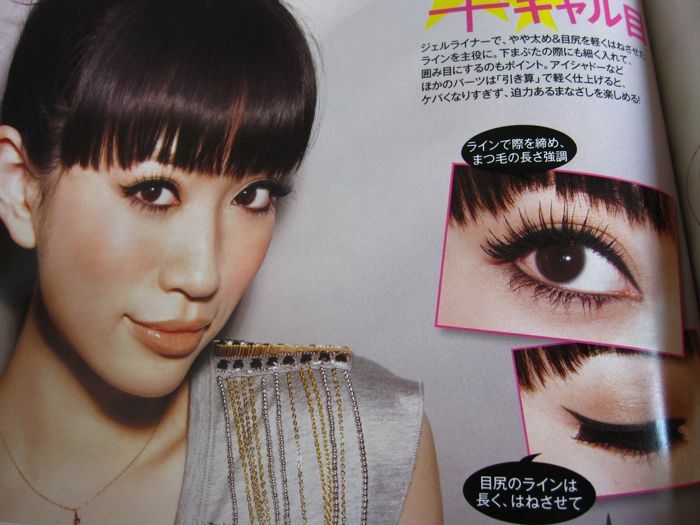 Tsubasa uses Lancome Oscillation mascara. Step 8: Use a heated eyelash curler to enhance the curl of the lashes. Step 9: Attach Dolly Wink eye lash No. 5 to the lower lid, starting with the inner corner. Do not apply mascara as that makes it look more unnatural. 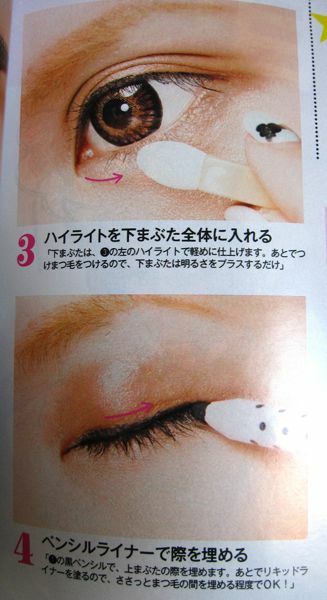 Step 10: Apply a highlighting powder under the eyes. Tsubasa uses Candy Doll Premium Lamé Glitter (Champagne). On the cheeks, Tsubasa used a light pink blush mixed with orange for a glowly summer look. And finally, for the lips, she used an orange-tone concealer to suppress her natural lip colour before applying an orange gloss for a milky finish. Just read on 2Channel that Beaute de Kose will be discontinued in September 2011. 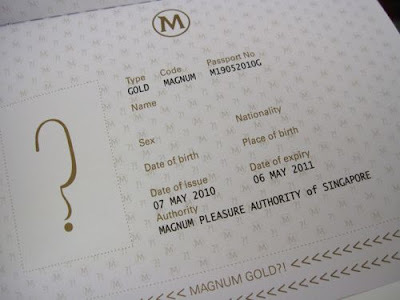 It is not yet confirmed if it will be replaced by another brand. In Japan, the counters have been merged with the Cosme Decorte counters, which also belong to Kose. No wonder the official website has been neglected since early this year, without even any update on the Summer Fantasist coffret which will be released on 1 June. It's always sad to see a good brand go. 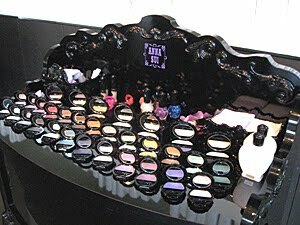 If you are interested in the Anna Sui "Kaleidoscope" fall makeup collection, do check out Japanese stylist Momoko Kawamura's blog for pics from the press preview event in Japan. Love the new eyeshadow packaging! Baila magazine has a sneak peek of the Lunasol Fall 2010 makeup collection on their editor's blog! Lunasol just held their press preview event in Japan for the collection. 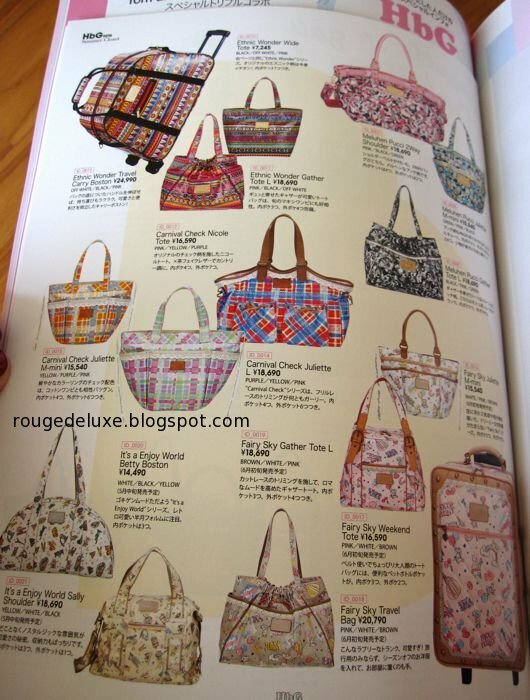 The collection theme is "Aurora Purification". 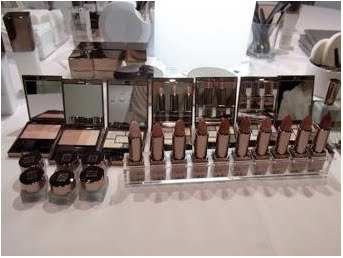 The collection includes five eyeshadow quints of soft, easy-to-wear shades, matching lipsticks and cream eyeshadows, two blush palettes, three nail polishes. 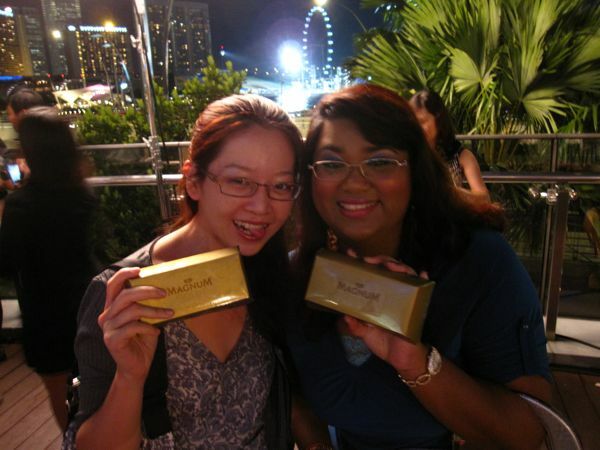 The highly popular Water Cream Foundation will also be revamped. You can see a close-up pic of the five eyeshadow palettes on this Japanese blog. The quint design is identical to that of the earlier Geminate Eyes series. The new fall palettes are shimmery but more translucent and refined than the Geminate Eyes palettes. The collection will be released on 20 August in Japan. Heard from the RMK SA that Luxasia will be launching the new Burberry Beauty line in Singapore around July but it's not confirmed yet which department store it will be at. The line will debut worldwide in July in 30 doors, including Nordstrom in the U.S., Harrods in London and Lane Crawford in Hong Kong. 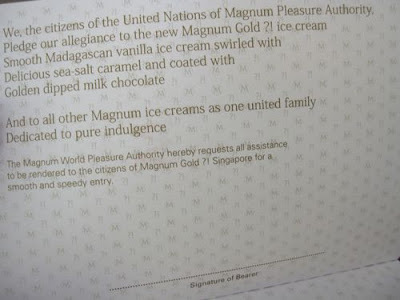 Given the prestige factor of the brand, my guess is that it will be at either Tangs Orchard or Takashimaya. 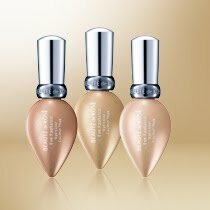 The collection ranges in price from US$24 for a Lip Definer pencil to US$59 for the Sheer Foundation compact, so I expect to see pricing around that of Dior. 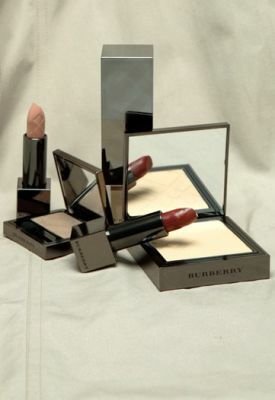 The lipsticks are embossed with Burberry's trademark checks. There are also rumours that Jill Stuart will be launching in Singapore. Not sure how credible it is but if it turns out to be true, well, it's about time! Kiss Me recently provided me with several of their Heroine Make Impact Eyelash designs to try out. I'm a complete novice at applying false eyelashes, having only worn them twice in my life, once for my wedding photo shoot in December and the second time was at my wedding in March. On both occasions, it was the makeup artist who put them on me. As I usually wear spectacles every day, false eyelashes are also impractical as they would keep brushing up against my specs. But since it's the weekend, I decided to play around with the lashes. I started out with the most natural looking set, which is 01 Natural Long. 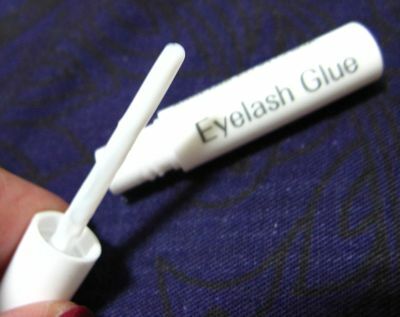 Each set comes with a small tube of eyelash glue. I did my makeup today with mainly RMK products such as the Spring Modern Eyes 01 Goldish Blue, Powder Foundation EX101, Super Basic Liquid Concealer EX-01 and Mix Colors for Lips 03 Natural Orange. 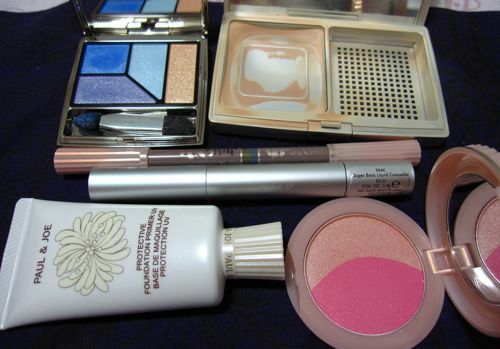 I also used Paul & Joe Face Color 07, Protective Foundation Primer UV and Eyebrow Pencil Duo 01. After applying the eyeshadows and curling my lashes, I fixed on the false lashes. I did not use any eyeliner or mascara after that. Putting on the lashes definitely takes lots of practice. I know some ladies use tweezers and some use special applicators but I just used my fingers to fix one end and then gently press down the rest of the lash as close to my lashline as possible. It took a few tries to get it right, including having to apply some extra glue at the ends but once the lashes were fixed on, they stayed put without falling down for the next 8 hours that I wore them. Overall, the lashes were quite comfortable to wear and at the end of the night, they also peeled off easily without much tugging. 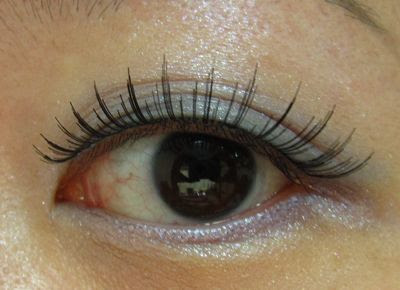 The only slight discomfort that I experienced was after a few hours, the inner end of the lashes on my left eye started to poke my eyelid but that could have been because I did not place it or trim it correctly. The lashes do help make my eyes look much more awake but they are strictly a weekend-only look for me as the length is too long to pass for natural lashes. 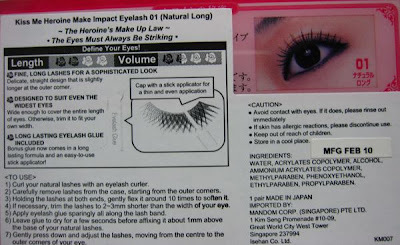 You can find Heroine Make Impact Eyelash at the "Kawaii Corner" in Watsons where they retail for S$9.90. 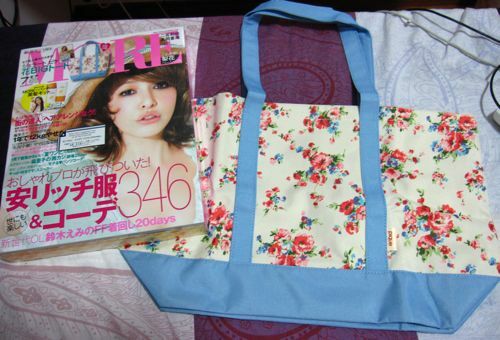 Picked up the July issue of More (S$19.60) at Kinokuniya today as it comes with a large Gelato Pique tote bag and Pantene Pro-V Extra Damage Care Shampoo (40ml) and Conditioner (40ml). 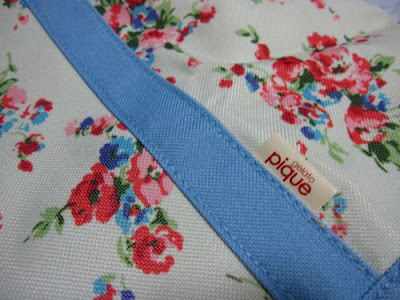 The tote bag is made of polyester with PVC coating. It feels quite well made with neat stitching and can fit the magazine comfortably with room for more stuff. 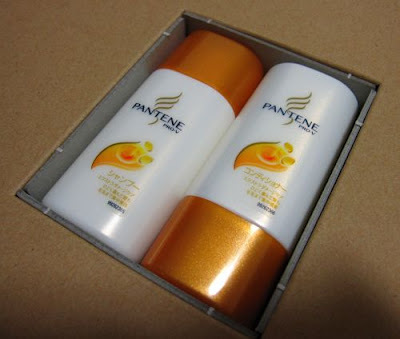 The magazine is awfully bulky when you buy it (about 2 inches thick) as the Pantene bottles come in a large cardboard box, which is just such a terrible waste of paper. 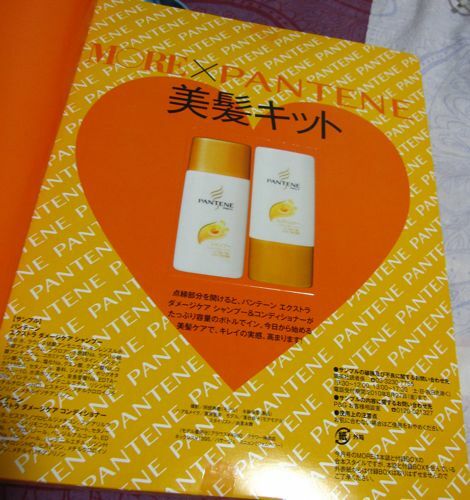 You can remove the outer cover with the attached Pantene box, as the magazine actually has an identical cover under the outer cover. The magazine itself is about 1cm thick. When I was at Kino in the early afternoon on Saturday, there were only about 10 copies of More left but perhaps there were more copies in the back as Kino usually brings in quite a large quantity of More. In any case, I think this is definitely one of the better magazine supplements and well worth the cover price! Here's a look at some of the upcoming Japanese magazine freebies. The release dates stated are for Japan. If you want to know when it will arrive in Kinokuniya in Singapore, please check directly with Kino. July issue of Steady (7 June): STNY by Samantha Thavasa muti-case measuring 20x34x9.5cm. Check out the video clip here. 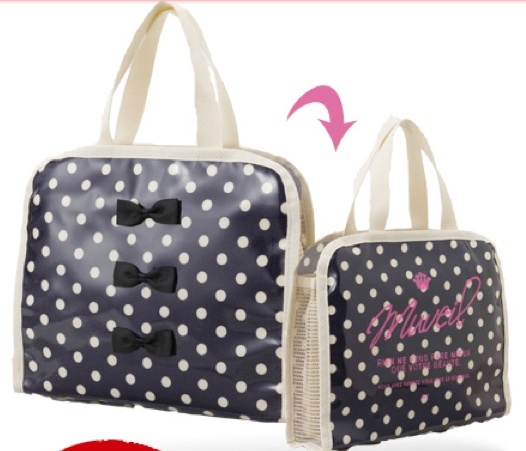 July issue of InRed (7 June): Muveil summer bag. You can view the video clip here. 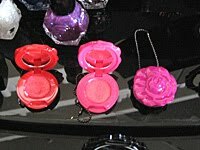 Here are some sneak peeks of the upcoming Anna Sui new eyeshadow singles and Fall 2010 "Kaleidoscope" collection from Voce! The collection will be released on 5 August in Japan and includes seven Eye Colour Duos (3990yen), 25 Eye Colours (2625yen), Eye Brightener (2625yen), Spot Concealer (2625yen, 3 shades), three limited edition Mini Rouge V (2100yen) and five limited edition Nail Colour N (1680yen). Magnum Gold Ice Cream Party! 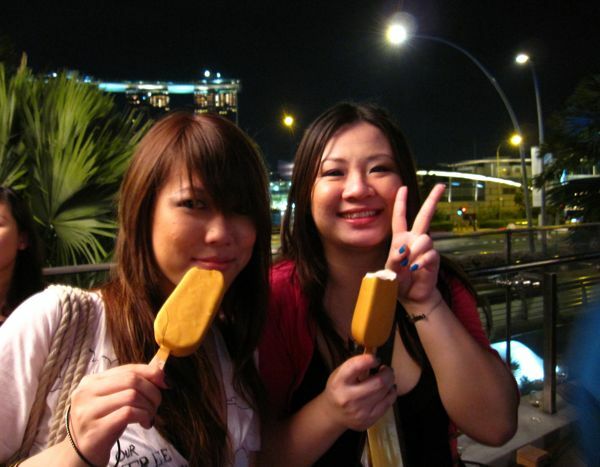 Thanks to the lovely Sandra (in pic below) of Sinkid, I was invited along with Mag, Kas, Sara, Chantana and Jenny to attend the Magnum Gold ice cream launch at the Waterboat House near Fullerton earlier this week. It was a lovely setting with the Marina Sands resort glittering just across the bay. 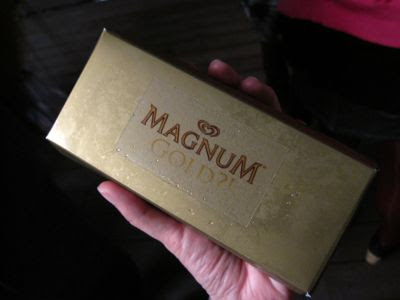 The Magnum Gold ice cream packaged like a solid gold bar. When I first texted Kas to ask if she was attending, she was like,"Of course! It's ice cream and it's sea salt caramel!!!" And indeed, the ice cream was yummy! 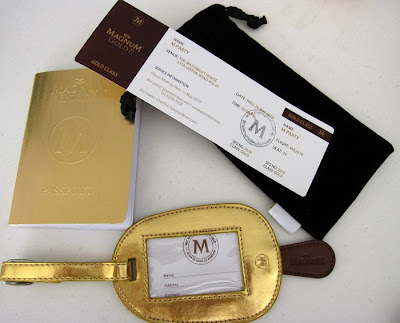 I was also fascinated by the lovely gold sheen of the caramel outer layer. Sara and Chantana enjoying their ice creams :-) Sara has her own Youtube channel, do check it out! 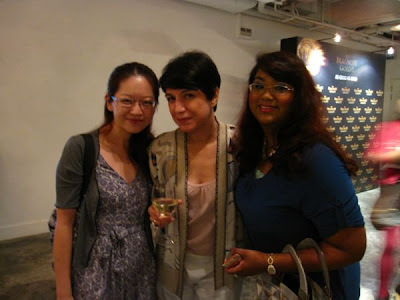 The ladies also had fun taking pics with ex-MTV VJ Utt at the party. 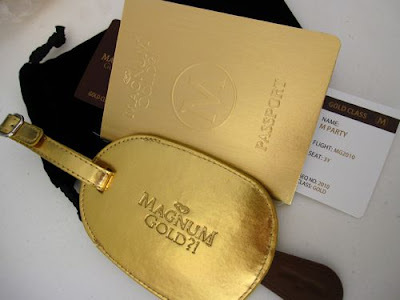 The guests were presented with Magnum "passports" and a super-cute luggage tag in the shape of the Magnum ice cream! The clever "passport" design is just hilarious! 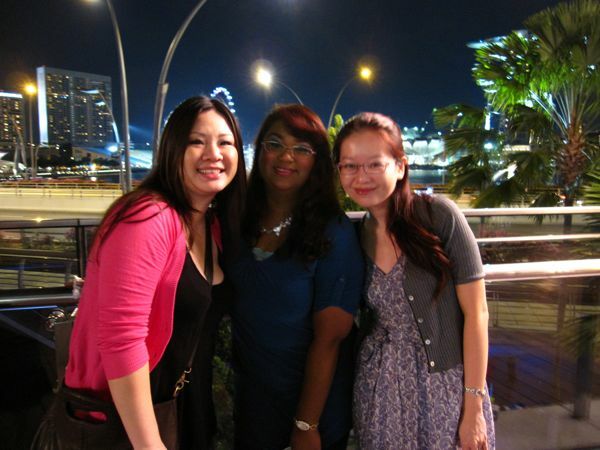 All in all, it was an incredibly fun evening out with the ladies even though I was absolutely knackered after a long day at work. Warmest thanks to Sandra! 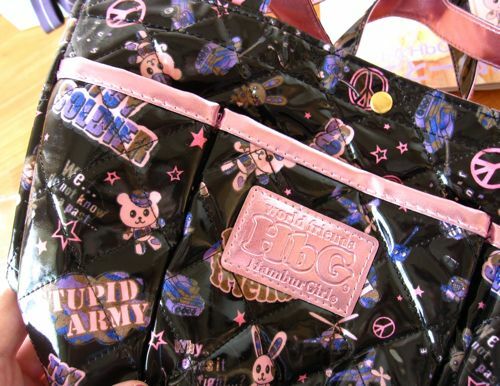 Picked up the new HbG 2010 Summer "Stupid Army" mook (S$28.70) at Kinokuniya on Thursday. There were only 5 copies left when I was there. 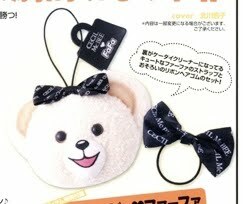 By Friday, I heard from Kas that it had sold out. The 58-page mook features Fujii Lena (spokesmodel for Canmake) on the cover. The quality of the mini Juliette bag is naturally much better than the HbG small tote that was given away with the April 2010 issue of Steady magazine. The "Stupid Army" bag is also about 30% bigger, measuring 31x19x17cm. The Juliette bags usually retail from US$150 upwards, so the mook version is a much more affordable option. If you are interested in it, do check with Kinokuniya if they will be restrocking it. 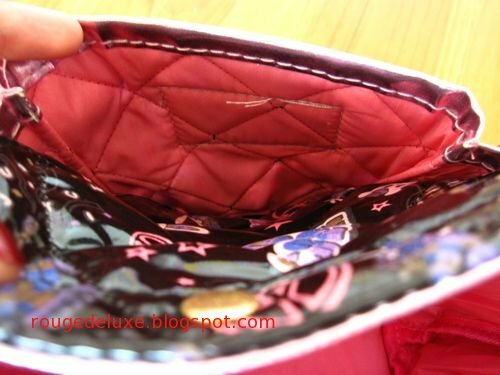 The interior is well padded. The bag is made of PVC, cotton and polyester. 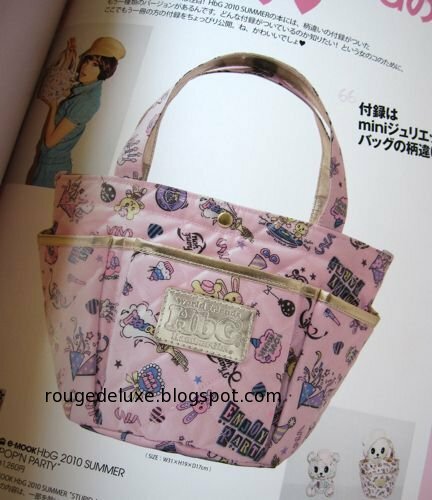 There is also a pink "Pop'n'Party" version available. There were still several copies of this at Kino on Thursday. 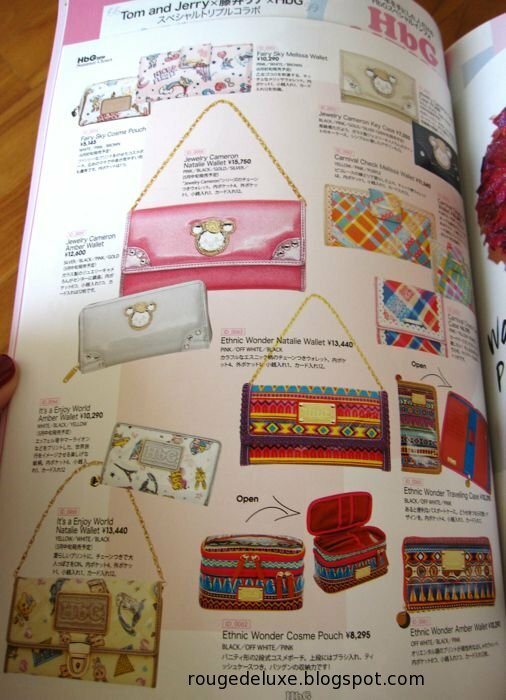 Celebrities, including my favourite actress Kristen Bell (of Veronica Mars and Heroes), sporting HbG bags and accessories! 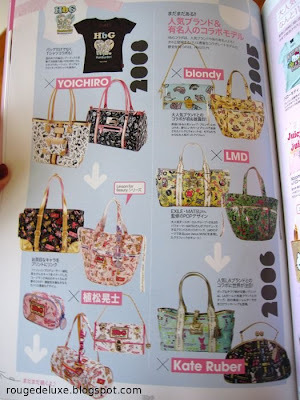 Bags, bags and more bags! 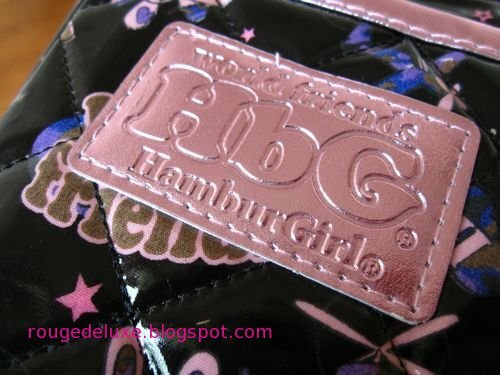 You can also check out the official HbG website here. 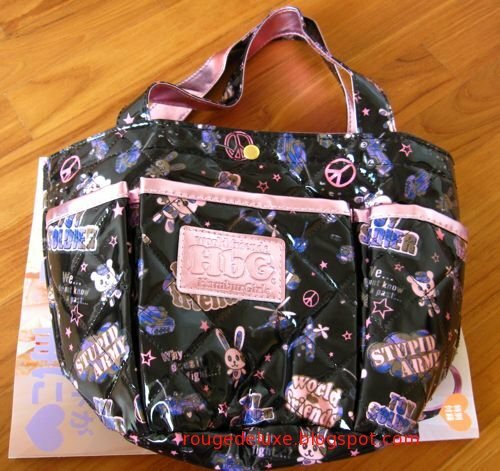 Shu Uemura Fall 2010 "Florescent"
New Tokidoki @ Play Imaginative!